What are 2nd-gen pets? Read our introduction to 2nd generation pets to learn more :). 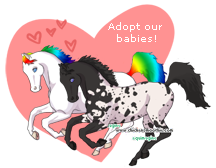 The Rainbow Maned horse parent is from August 2009 and the Black parent is from January 2010. This is the first horse 2nd Gen litter on CS :). This litter was bred by Tess. 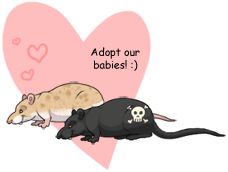 The Spotted Rat parent is from the Advent Calendar and the Pirate rat Parent is from August 2008. Sorren Fey bred this 2nd Gen Rat litter. The Pink Sorbet parent was from July 2008 and the Blue Balloon parent was from August 2008. This litter was bred by Tess. Unfortunately, there was no monthly 2nd Gen release for October, but this month didn't disappoint as there was a special Halloween Litter available, as well as another fairly strange litter. The Black parent was a GPPS of the Coraline PPS from the Advent Calendar of 2009. Demon dog parent was from Halloween 2009. The two parents were released in the 2009 Halloween event. Many people do not consider this litter to be "2nd Gen" due to the lack of a 2nd Gen tag, and because previously released designs were just altered for the litter. 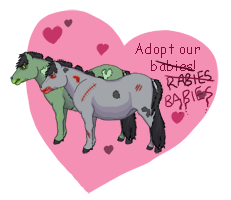 Zombies "infect" creatures, and so the disease was spread to several other CS pets, and they were released as a "2nd Gen" litter. At the first of December, new pets were released and another Christmasy 2nd Gen litter was released. The pink parent, was released in June 2009 and was made by Shima.Luan. While the Snowflake Parent was released in the 2008 Advent Calendar and was made by Tess. A new year and a new 2nd-gen couple. This particular litter is rumored to be one the most popular of all the litters. Shima.Luan bred this litter. The Pink parent is from November 2008 and the blue Aztec parent is from March 2009. In the midst of the CS Easter celebration, the 2nd CS birthday hit on April 8th 2010. A new 2nd Gen litter, that was bred by Sorren Fey, was released along with the monthly pets. The Husky parent was from February 2009 and the African dog parent was from April 2009. On June 1st we got a new set of dog 2nd Gens made by guest artist DisabledLlama. Along with the dogs another CS first; Butterfly Wolf 2nd Gens. They were made by Sorren Fey. The bumblebee parent was an adoptable in April 2009 and the green parent was an adoptable in August 2009. The brown/grey parent was an adoptable March 2009 and the pink swirl parent was an adoptable in May 2009. 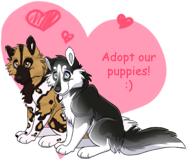 The pink parent was an adoptable in September of 2008, while the green parent was an adoptable in November of 2008. This month brought about the second litter by guest artist DisabledLlama, and two years since the very first 2nd Gen litters were released. The brown parent was released in February 2010, while the Orange parent was avaliable in November of 2009.